Note : Students do the darndest things. They do not even spare the Father of the nation. 1) Student Name : Chronicwriter. Occasion : Mock Press Competition. Chronicwriter donned the role of Gandhiji . The Judges asked him, " Among the present day celebrities, who can you associate yourself with?" Chronicwriter (Gandhi): I would associate myself with Salman Khan and Mallika Sherwath. All of us shed our clothes to reveal our belly buttons. I do it for our Desh (Nation). Salman does it for Aish (Power) and Mallika for Cash. Trivia: Chronicwriter was eliminated in that round. He started this blog page and started to rant. Teacher: Write a Note on Gandhi Jayanthi. Ravindra Jadeja: Gandhi Was a Great Man, Jayanthi is a super Hot girl. Gandhi loved Jayanthi. One day he proposed to her. She said Yes. Then they got married. Their wedding day is celebrated all over the world as "Gandhi Jayanthi day". Anand Jon was playing with two ten Rupee notes and suddenly the fashion designer in him, emerged out in art form. The trivia part did not surprise me since I disapprove a lot of things that the 'Father of Nation' said and did. Each time I voice my disapproval I draw a lot of flak from the 'worshippers' who throw a 'Oh you are such an anti-social element' sort of look at me! I applaud your audacity! Kudos! Thank You for sharing this Chriz! :) Now I shall share it with the Non-anti-social-elements and enjoy imagining the constipated look on their faces :P LOL! I don't have any enmity against Gandhi. I dunno him personally. All that I knew of him was the good side of him that my history teachers taught me. But when i came across these links, I came to know about his other side too. Let everyone of us know all the sides of truth and may we have a balanced view of things. 'Balanced view of things' - Well said! :)That is precisely why I voice my disapproval. I don't hate the believers and expect them not to hate me for disapproving. Again,disapproval doesn't mean hatred. It is my way of saying that there is more than what meets the eyes. Fanaticism and sanity hardly co-exist! 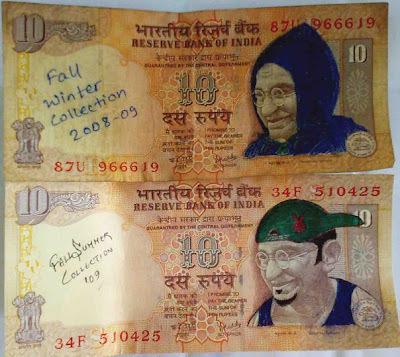 The 10 rupee notes - Hilarious raised to the power infinity. Trivia : Did know some of them. Quite shocking. But true. Nice, never knew all this. Thank You. I never some of the facts,bt thnz 4 rest of info..
no- one chalenge this time in 60 yeares!! That's a pretty balanced post I would say especially on the Gandhiji side of the equation. I did not know about his participation in the war etc but the urine drinking, strife within the family, inconsistent views regarding western medicine and medical methods - I am aware of! amazing post. but if the facts are absolute then this blog contradicts chrony's fourth law.